Haven’t you ever wished to travel the world, see the sights, and then knock bricks off floating platforms and watch as they rain down on the unsuspecting people below? Of course you have! Now you no longer have to wish for such horrors as Demolish presents us with a challenging physics platform clearing game app. For a limited special $0.99 price (from $1.99), Demolish is brought to us by AMC Workshop on the iPhone, iPod touch, and iPad and is available in a Lite version. Demolish is created by the same makers of “The Hawker”, another app that I had reviewed from AMC Workshop. So. You are armed with metal balls that cost you points in order for you to fire them. There are a pile of bricks and blocks on a platform and your job is to use different sized balls (the bigger and heavier they are, the more points they cost) and knock down those bricks off the platform for more points. If you can make it through the level with more than 100 points, you win and can progress further! Tap the upper corner to change the ball size, tap and drag the ball within the shooting area and let go to smash the ball into the bricks. The challenge is trying to be as minimalist as possible. If you spend 20 points to use a big heavy ball, try to clear the platform in one or two shots or else you’ll fall just short of 100 points by the end. It’s all about careful aim and a good amount of luck. You have more than 50 different levels to really push how good your aiming skills are, so get good REALLY fast. Like The Hawker, this game has really strong, visually pleasing graphically style. Backgrounds are stylish and some of them would look great as my computer desktop wallpaper. The bricks are well done with shadows and highlights to make them really pop off the background, and the user interface is crisp and easy to read. Puzzle design for Demolish range from fairly simple to ridiculous. Explosives, stacked towers, and rather clever domino-effect stages really make each level interesting. I do find that the pacing sometimes spikes in difficulty randomly. One stage could having you retrying dozens of times and when you finally conquer it, the next stage just requires a single shot to clear. Demolish is extremely pretty, the gameplay is simple but challenging, and the gameplay style really fits the casual gaming crowd. I did have a couple issues with crashing however. Sometimes, the game will just feel like crashing; in middle of levels, while I’m shooting the ball, and sometimes when I’m watching the bricks falling. Just seems to be random. Nevermind the crash issues though; that more than likely is going to be fixed in future patches. Demolish is still a well done puzzle game with solid gameplay and art design. Take a spin with Demolish in its Lite form and support the makers by buying the full version if you like the app. 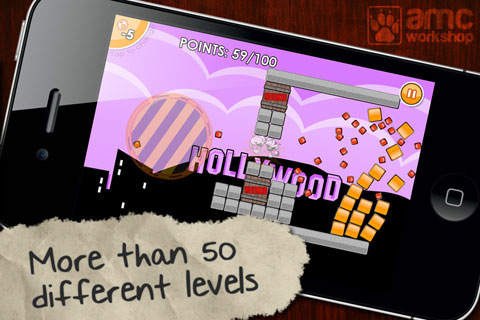 Sample the free version of Demolish on your iPhone. 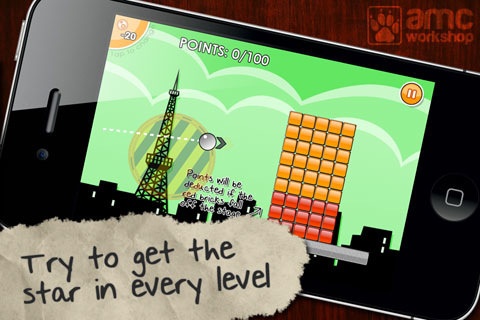 AppSafari review of Demolish was written by Joseph Ho on January 21st, 2011 and categorized under App Store, Games, Physics Based, Puzzler, Resource Management. Page viewed 3742 times, 1 so far today. Need help on using these apps? Please read the Help Page.